After seeing a great movie and doing a few errands, Mom and I decided to go to an old favorite of ours - Magoni's Ferry Landing - located just over the Brightman Street Bridge in Somerset. It was a little before 7:50 p.m. when we pulled in to the busy parking lot. It seemed that every place in the tiny front lot was taken, and although they do have an extra lot behind the restaurant, I was able to find an open space facing the front door. We walked in and were greeted by the hostess who sat us at a table in the back room. It was cool and dry in there which was very welcoming after being outside in the warm spring air. She gave us two menus (long, plastic, printed pages encased in black, pleather covers). Their specials were located in a plastic stand on every table. Although I already knew what I wanted, Mom decided to check out the other options in the menu. She has been eating at Magoni's for as long as I've been alive, and this is by far one of her favorite restaurants. The friendly waitress in her Magoni's uniform came over and asked for our drink order. Mom ordered a Coke, but they only carry Pepsi and Mom didn't mind the switch. I ordered a Diet Pepsi and they quickly arrived in plastic Pepsi glasses. After bringing the drinks, we placed our order with the waitress. I ordered my favorite - the fettuccine alfredo for $10.95 (comes with soup, salad or chowder). You can add broccoli and chicken for an extra $2, but I chose not to and picked white clam chowder as my starter. Mom chose my sister's favorite - the boneless fried chicken (with cranberry sauce) for $11.95. It comes with your choice of potatoes and vegetables or pasta. It also comes with soup, salad or chowder. Mom opted for pasta and minestrone soup. The soups arrived quickly (with oyster crackers) along with a small loaf of bread cut in five slices. There was no butter on the table so I went on a quick hunt to track some down. Both soups were deliciously hot and the bread was delicious. I opted to dip my bread into the chowder for an added treat. As we waited for our meal, I watched the Keno game on a nearby TV and listened to the couple next to us as they tried to figure out what to order. Apparently they had never been to a restaurant before because they were scrutinizing over every menu detail. A little while after we finished the soups, the waitress brought over some of Magoni's signature dessert - the sugar-topped cinnamon sticks. There were four on the plate and Mom and I each ate one before our meal arrived. They were hot and delicious - as always. We left the other two on the plate and put the plate to the side to wait for our entrees. The waitress quickly came back to apologize if our meals were a little late because the entire staff was waiting on a party of 120 in the large green room behind the double doors. The food arrived at 8:20 p.m. and it was steaming hot. My fettuccine was topped with parsley and came with a spoon to assist me in twirling the pasta. Mom had two beautiful pieces of fried chicken along with a small plastic cup of cranberry sauce which she cast aside (she doesn't like cranberry sauce). Her pasta was steaming and was topped with marinara sauce. The waitress asked us if we would like some grated cheese but we both declined and dug in. My fettuccine was the usual consistency and the alfredo sauce was outstanding. It had been a little cheesier on past visits, but even despite this it was absolutely wonderful. Mom scarfed down her pasta and chicken which I stole a piece of. It was pure white meat with crispy fried skin and an almost buttery taste. Because the portions were so large, I left a few strands of pasta behind and Mom left about five tiny pieces of chicken. Although we were stuffed, we did find room to finish off those last two cinnamon sticks that were waiting for us on the table. The price is definitely well worth paying for the amount of food you get. *Although the bill stated that we had Coke, we actually had Pepsi. We left $34 on the table which included a 20% tip for the waitress. Although we have been to the bathrooms in the past, we did not use them on this visit. There are two stalls in the women's unit and it is generally clean. We said goodbye to the hostess and opted not to take a mint before leaving. 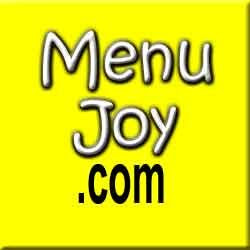 They do not offer a paper take-out menu to take home (Mom collects them). Mom and I had already rated this restaurant a 5 (excellent) because of previous experiences, and this visit was no different. Magoni's is definitely five-star and I look forward to my next journey over the bridge to this Somerset gem. 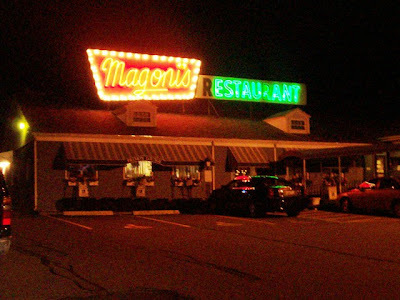 Magoni's is a family-owned restaurant that has been around for over 50 years and has a very comfortable environment. The different rooms are decorated with tables and chairs with carpeting, curtains and blinds to give it a "homey" feel. The subdued lighting makes it cozy and the temperature is usually perfect, although today it was a little cold for some who sat in the back room near us. With the cloth napkins, lack of tablecloths and paper placemats, Magoni's is kept very clean and the wait staff is very attentive. Most of the people who work there have been there for years, so it must be a pleasant environment. Liquor is served and there is a bar off to the side of the building that has the full menu available. They also have pizzas, sandwiches, homemade soups and a children's menu. The "early bird" meals are available from 11 a.m. to 8 p.m. and lunch portions are served from 11 a.m. to 3:30 p.m., Monday through Saturday. Although checks are not accepted, all major credit cards are. Parties of eight or more should call ahead or make reservations, and the gratuity will be included on the bill. Gift certificates are available and there would be an added $2 charge for plate sharing.